Program #9: Is it possible to Pass this as parameter of a method? Yes we can pass this as the return type of the method. As "this" also points to current class object we can always return this as return type of the method. if we return this as return type the return type of the method should be class name because this always points to current class object. Result will be current class object and we can do all stuff as we are doing with object. 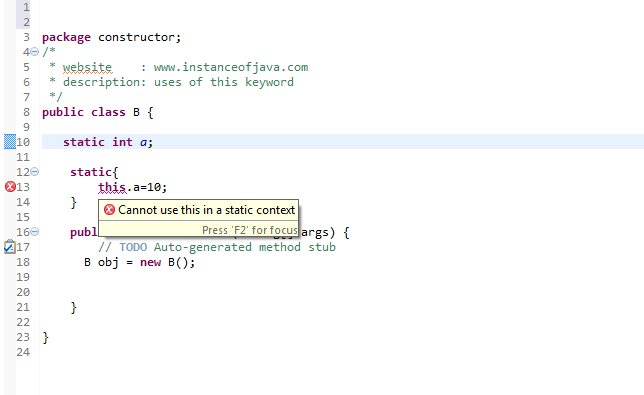 Program #10: Is is possible to access static variables and static methods using this keyword? Yes we can refer static members using this keyword. But it is not best practice to use this to access static variables and static methods. Program #11:Java program to test whether we can use this in static block or not? We can not use this in static block because static blocks executed in class loading time itself at that time object will not be created and this refers to null so we can not use this in static block leads to compile time error. 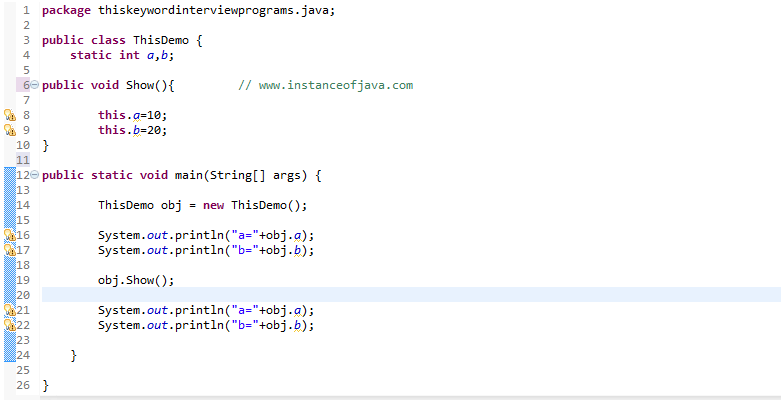 Program #12: Java interview program to test whether we can use this in static methods?